Happy weekend! 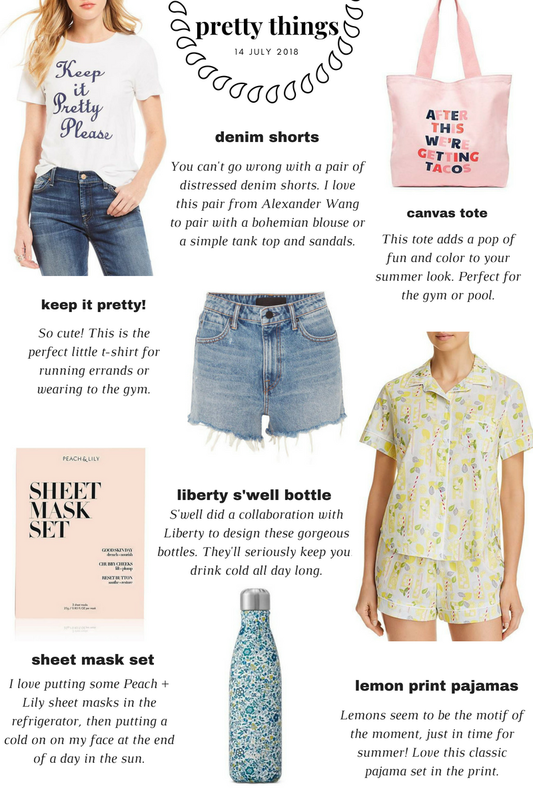 This week's edition of pretty things is all about the essentials you need for hot, summer weekends. I love a cute, graphic tee like this one from Draper James. Wear it to the gym or when you're running errands during the day. You can dress it down with denim shorts or leggings and dress it up with a wrap skirt an espadrilles. A good pair of jean shorts are the ultimate summer go-to. This pair from Alexander Wang is distressed and the perfect fit for pairing with a bohemian top, t-shirt, or simple tank top and kimono. If you need a cute bag for the pool, this one from Ban.do might just be the move. I love anything with a lemon motif lately. It feels so fresh and summery! Jane & Bleecker has a pair of lemon-print pajamas that remind me so much something you'd see a chic woman wear in the 50s. I love, love, love my S'well bottle and just ordered this Liberty print one. These are a must for summer because they will literally keep your drink cold all day, even if you leave the bottle in a hot car. They're magic. At the end of a sweltering day outdoors or even just at work, I love to come home to a Peach + Lily sheet mask. I like putting them in the refrigerator in the morning so they're nice and cold when I get home!